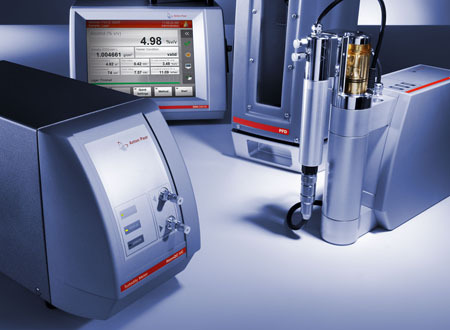 A solution for the measurement of turbidity in liquids, the HazeQC ME turbidity measuring module, is provided by Anton Paar as part of a modular measuring system. The approved ratio method with measurement at three angles (transmission 0°, scattered light at 25° and 90°) is used to prevent the influence of particle size on the turbidity value. The measurement is carried out at a wavelength of 650 nm ±30 nm (MEBAK- and EBC-compliant) in a cell with adjustable constant temperature. This turbidity measuring module expands Anton Paar's product portfolio and adds a further important parameter for analyzing liquid samples - providing the same high quality expected of Anton Paar products.